Thankfully, Crossway Foundation aims to rectify that — sooner than later. The Crossway Foundation is an exceptional project conceived and developed by the Prince’s Regeneration Trust in partnership with Offscreen and Edge of Arabia. Together, they have identified a unique opportunity to transform a group of historic buildings in the heart of East London into the United Kingdom’s first dedicated UK-Middle East education and arts center. The Foundation is a vision of a number of individuals from an expansive variety of fields, including the arts, intercultural education and community cohesion. Stephen Stapleton, director and founder of Offscreen and Edge of Arabia, leads the small, but passionate team, which includes: Adam Williamson (Artist and Co-founder of Offscreen Workshops), Raheel Mohammed (Director and Founder of Maslaha), Abdullah Al-Turki (patron and co-founder of Edge of Arabia) and Ahmed Mater and Abdulnasser Gharem (Saudi artists and Co-founders of Edge of Arabia). Over the past seven years, Offscreen and Edge of Arabia have garnered an impressive portfolio of projects and achievements between the UK and Saudi Arabia, Lebanon, Jordan, Pakistan, the Gulf, Germany, Italy, Turkey and the United States. Their work with young people and artists has generated five international exhibitions, seven award-winning websites and over 200 workshops and resources for 1,500 schools, which have influenced the lives of over 25,000 young people and have reached an estimated audience of over two million. 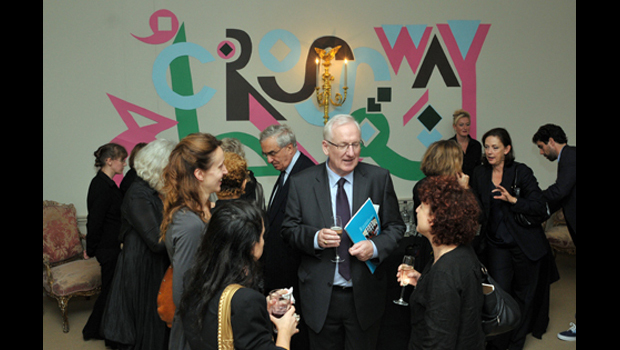 The exceptional success of these unique initiatives has provided an ideal platform for the Crossway Foundation to further develop cultural and educational activities between the UK and the Middle East. A new single site will extend the reach of their proven educational and artistic programs, bringing benefits to communities in both the UK and abroad. Based on the work of these two founding organizations, the Foundation will deliver four core activities: student expeditions, educational resources, school and museum workshops and a Middle East artists’ program. When established, the Foundation will house an art gallery, artists’ work and living quarters, a practical art and design workshop, an educational suite and flexible office space for social enterprises and charities to improve cultural relations between the UK and Middle East. Echoing the sentiments expressed by former US President Bill Clinton at the Global Competitiveness Forum this past month, Stapleton agrees that positive change is often easier to achieve if it comes from “the bottom-up and not the top-down.” Thus, Crossway aims to engage young people because, as cliché as it maybe, they are our future. By basing the Foundation in East London, an area that has become home to a burgeoning art subculture, while still submerged in overt social and economic deprivation, Crossway aims to address the “educational deficit” of local communities and the marginalized youth that compose them. “We want to engage those kids who lack access to positive cultural stimulus and role models,” added Stapleton. The young British population has become more vulnerable to negative messaging about Western-Middle Eastern relations, while the vacancy of an institution signifying the contrary only seems to further exacerbate the threat. Having such centers will cultivate the burgeoning art scene in Saudi Arabia and the Middle East, as well as help regional artists build their confidence. “By nurturing the local artists, we are indirectly developing a truly new national perspective,” added Gharem. Another rare feat of the Foundation is that this “new perspective” is not one of elitism, as the reach of many other initiatives seems to be limited too. Don’t be fooled by name. Albeit, the word Prince may be present, the Foundation is positioned to omit all types of potential bureaucracy. The initiatives are all encompassing and target a diverse demographic, from under-privileged kids of rural villages to prominent merchant families and royalty. With the London Olympics quickly approaching next year, the vision of Crossway is to coincide its establishment with the major event. “Our supporters recognize that this project is ambitious and historic and the timing is central,” stated Ed Williams, project director of Crossway. The Crossway Foundation is now in the process of attracting major public organizations, private corporations and keystone donors to unlock the capital costs of acquiring and renovating the building. The total cost of the project is likely to cost between £3.5 and £4 million.